Note: All engine and gearbox mounting surfaces must be clean and dry prior to installation of this kit! Features a 6.01:1 Gear Reduction. 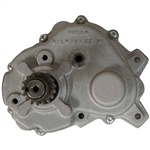 NORAM has added to its family of reduction gear boxes a 2:1 chain driven wet clutch activated unit. This product is designed for the robust demands of the OEM rental and karting markets. Proven components ensure maximum run time and performance. Innovative design allows us to provide this product at a cost effective price. Briggs & Stratton 900 Series 6:1 Gear reduction Gas Engine, Recoil Start, Perfect for Mixers or any other application where a 6:1 gear reduction is used. 9 HP Gas Engine, Recoil Start, Perfect for Mixers, or any other application where a 6:1 gear reduction (small engine gear reduction) is needed. BRIGGS AND STRATTON HORIZONTAL SHAFT 6.5 HP VANGUARD ENGINE. 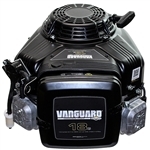 New, BRIGGS & STRATTON Vanguard commercial series engine. External 6:1 gear reduction. Features include Dura-Bore cast iron cylinder sleeve, float carburetor for consistent easy starting, maintenance-free electronic ignition, low oil shutdown, overhead valves for cooler operation, Dual-Clean air cleaner, compression release for easy starting, engine mounted controls and TransportGuard fuel shut off to prevent fuel from diluting oil during transport. EPA compliant for all 50 states. 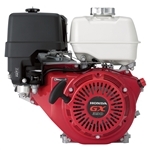 Honda GX120 Gas Engine, Recoil Start, 6:1 Gear Reduction, Perfect for Lawn and Garden equipment, Cement Mixers, and various Industrial and Commercial Uses. 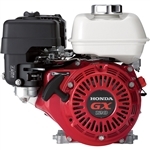 Honda GX160-HX2 Engine, Recoil Start, Perfect for Mixers, or any other application where a 6:1 gear reduction motor is needed. Convenient Bolt On Design adapts to Most Makes and Models. Fits 1" Keyed Shaft. Features a 2:1 Gear Reduction. 9HP Engine. 6:1 Gear Reduction Gas Engine. Electric Start, Perfect for Mixers, or any other application where a 6:1 gear reduction is needed. Honda GX390 Gas Engine For Sale, Recoil Start, Perfect for Cement Mixers, Hydraulic Pumps, Go Karts, Generators, Pressure Washers, and various Industrial and Commercial Uses. The Briggs & Stratton motor with 1” diameter shaft and 25 horsepower is the perfect replacement for your zero-turn and riding mowers and works well in a wide range of commercial and industrial applications. The powerful and compact design delivers plenty of torque, with decreased emissions and increased fuel efficiency compared to other motors in its class. The Briggs & Stratton Professional Series motors require less maintenance over the life the motor, and the electric start system ensures your motor starts when you need it, even in the toughest conditions. The Briggs & Stratton Professional Series 25-horsepower motor is versatile and built to last. Order this powerful motor now to enjoy our competitive prices and fast, free shipping, or give us a call at 1-888-208-2088 to have our team of professionals help you find the right motor to fit your needs. At Carroll Stream, we carry the B&S 25-hp gas motor with electric start for zero-turn and riding mowers, tractors and a wide range of other applications. This is a small and powerful four-stroke OHV small engine designed to deliver increased fuel efficiency and decreased emissions without sacrificing power and torque. This Briggs & Stratton Professional series motor is virtually maintenance-free and will outlast almost any motor in its class. This powerful Briggs & Stratton motor is one of the best, most versatile, rugged motors on the market. Buy this B&S 25-hp gas motor for your most important projects to ensure you get the job done right without breaking your budget. Order online to enjoy our fast, free shipping, or give us a call at 1-888-208-2088 to have our team help you find exactly what you need before you buy. Maintaining a fleet of commercial mowers – or even just one – can be a challenge. From keeping everything running smoothly on a daily basis to finding the specific parts that need replacing over time, there’s a lot to keep track of. If you’re looking for a motor that offers reliable performance specifically for commercial mowers, this Briggs & Stratton 18 HP recoil start motor is what you need to get back in business. Its features include a forced air cooling system for optimal efficiency, as well as a mechanical governor for safety and control. Although it is the perfect replacement engine for many engines on wide-area walk-behind mowers, this Briggs & Stratton gas motor comes with recoil start and 570cc so you can expect dependable power on both your riding or walk-behind mower. The 18 HP Briggs & Stratton Vanguard comes with a three-year warranty for commercial use, so its quality is assured. Order now and get it shipped for free from Carroll Stream Motor Company! Carroll Stream 20HP electric-start gas motors are perfect for a wide range of industrial and commercial applications. These powerful four-stroke V-twin engines come with electric or recoil start mechanisms and run on unleaded gas. Our 20HP gas engines with muffler included mount in minutes and are compact enough to fit into many small engine compartments. They come with everything you need for installation and a handy user manual for troubleshooting any issues along the way. This motor is a great replacement for other motors, including those from Kohler, Briggs & Stratton and many other top brands. Whether you’re installing a new motor for your lawnmower or building a new go-kart, these small motors deliver the power you need on even the most conservative budget. Our motors are versatile, powerful and built to last. Replace your old or worn-out motors with this upgraded model for increased power and greatly improved performance. Buy now to take advantage of our competitive prices and fast, free shipping. 25 HP Briggs and Stratton Gas Engine, Electric Start, Perfect for Zero Turn, Riding Mowers, and various Industrial and Commercial Uses. 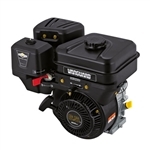 At Carroll Stream, we carry Briggs & Stratton 27HP motors. These are powerful motors for riding mowers and other heavy-duty industrial and commercial applications. Briggs & Stratton motors are a perfect replacement for old, worn-out motors, including those from Kohler and other top brands. 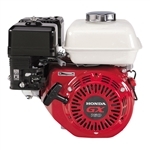 Whether you’re replacing your walk-behind mower’s motor, replacing a powered saw motor or building the perfect go-kart, this motor fits into many compact engine compartments and can replace many 30HP motors as well. This engine runs on unleaded gas, has a reliable electric-start mechanism and comes with everything you need for fast, easy installation. 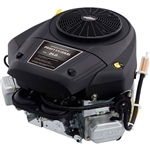 Briggs & Stratton 27HP Turf Professional motors are versatile, powerful and durable. We offer the very best motors for your next project with the most affordable prices and fast, free shipping. Buy online to find the right motor for you, or contact our experts for help finding exactly what you need. The Kawasaki FS541V-S28 is an excellent choice for both industrial and commercial applications, whether your goal is to customize a new mower or replace a Kawasaki 15 HP recoil start motor in a mower you’ve relied on for years. This model includes a built-in rotating grass screen, which provides protection from debris that can damage an engine’s performance over time. The motor also features a recoil start, clutch coil and a separate choke and throttle – perfect for walk-behind mowers of all kinds. This model is used on Toro, Exmark, Scag, Bad Boy, KMC, Ariens, Excel, MTD, Dixie Chopper and many others. 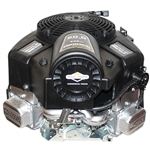 Carroll Stream Motor Company stocks only the best small engine motors available on the market. Our competitive prices and fast shipping ensure you get the equipment you need when you need it most. 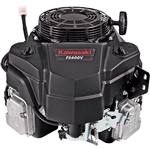 Order this Kawasaki 15 HP replacement motor today and get free shipping! 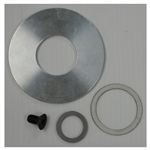 *Used on Toro, Exmark, Scag, Bad Boy, KMC, Ariens, Excel, MTD, Dixie Chopper, and many others. Ask us about price matching! In Stock! Same day Shipping! Kawasaki 18.5 HP Gas Engine, Recoil Start, Clutch Coil, Separate Choke and Throttle. Perfect for Walk behind mower, and various Industrial and Commercial Uses. Kawasaki 18.5 HP Gas Engine, Recoil Start, Clutch Coil, Oil Filter Side Muffler, Separate Choke and Throttle. Perfect for Walk behind mower, and various Industrial and Commercial Uses. If you’re looking for a new engine for Zero Turn Repower, golf carts and various other industrial and commercial uses, look no further than this Briggs & Stratton 16 HP recoil start motor. With this motor, you’ll get the power of gas with an EPA-approved clean electric start. Its forced air cooling system reduces the engine’s internal temperature for stable performance while keeping airborne debris at bay. V-Twin OHV technology in this Briggs & Stratton motor means better fuel economy than the competition, as well as lower emissions. 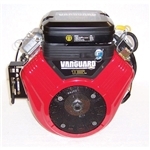 The 16 HP Briggs & Stratton Vanguard also features a cast iron cylinder sleeve, ensuring a long engine life. And if something does happen to go wrong, you’re covered with a three-year consumer and commercial warranty. Order today and take advantage of this great price point as well as free shipping from Carroll Stream Motor Company! Kawasaki Gas Engine, Recoil Start, Clutch Coil, Combined Choke and Throttle. Perfect for Wide Area Walk Behind Mowers and various Industrial and Commercial Uses. Direct Replacement for many FH381V and FH430V engines. Call for cross reference help. At Carroll Stream, we have the best deals on Kawasaki replacement motors for zero-turn mowers and a wide range of residential and commercial applications. 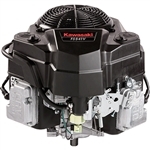 This Kawasaki 18.5HP motor has a powerful 4 stroke OHV twin cylinder design that delivers increased fuel efficiency and performance compared to other motors in its class. The Kawasaki FS600V motors easily mount to your equipment using a sturdy 4-bolt configuration that provides plenty of stability. The high-efficiency air cooling and oil systems ensure the motor won’t overheat even after hours of continuous use. This Kawasaki replacement motor has the power and versatility you need to tackle the toughest jobs quickly and efficiently. 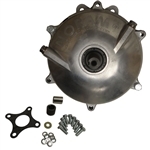 This motor is the perfect replacement for Toro, Exmark, Scag, Bad Boy, KMC, Ariens, Excel, MTD, Dixie Chopper and many more. Order now to enjoy our competitive prices with fast, free shipping or call us at 1-888-208-2088 to speak with one of our experts.